Fountain Pen Modifications and Reviews in Singapore! 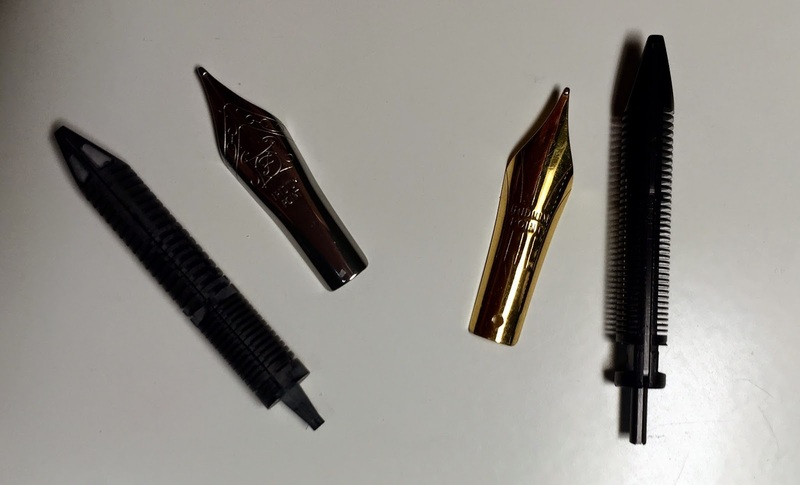 In this post, I will be comparing 2 pens that I had recently acquired. 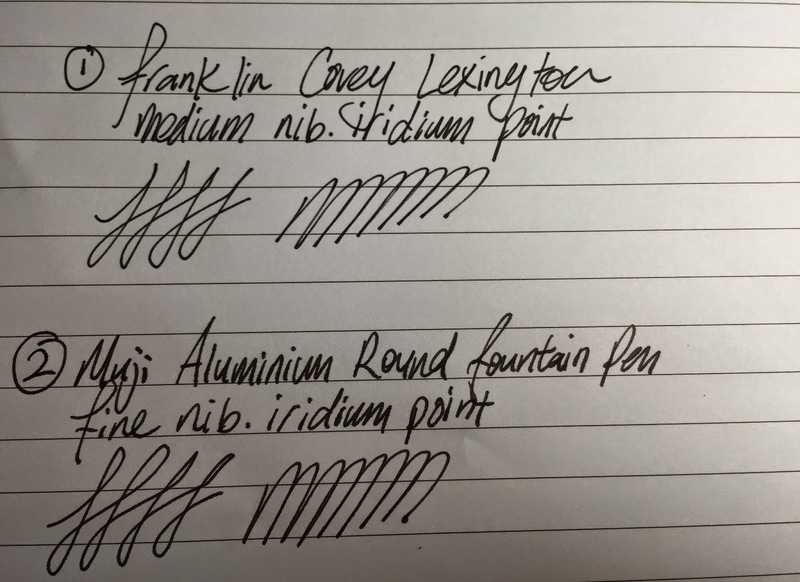 As the title suggests, the first is the Franklin Covey Lexington ("FC Pen") and the second is the Muji Aluminium Round Fountain Pen ("Muji Pen"). The idea behind why I wanted to do this comparative analysis was because both Nibs are said to have "Iridium Points". To be honest, I did not know much about Iridium at the point of time when I had gotten either pen and it was only much later that I realised what that actually meant. If you are interested in what an "Iridium" nib or point means (and what resulting significance it has for a fountain pen), there are many interesting articles on the internet. For example: this article on nibs.com (http://www.nibs.com/article5.html) talks about why "Iridium" (on a fountain pen nib) is not really "Iridium" anymore. In a nutshell, Iridium is actually a very rare metal which is part of the platinum group of metals and is highly sought after for its durability, hardness and resistance to corrosion. In the past, tiny Iridium beads were commonly welded onto gold nibs to reinforce them (as gold is much softer and therefore more susceptible to the wear and tear associated with writing). Given the relatively cheap prices of the FC Pen and the Muji Pen respectively, it would be safe to say that actual Iridium was not used to "tip" their nibs. Some other type of alloy was probably used to achieve the same general principle behind the idea of why Iridium is used - i.e. to give the nibs a longer lifespan. With that being said, let's dive into the comparative analysis of the 2 pens now (skip to the end for the summary and conclusion if you want to avoid the lengthy comparison). The FC Pen that I got is readily available from Times Bookstore (specifically, I got mine at the Tampines Mall branch) and it cost S$33.00. It came in a variety of different colours and finishes, but I opted for the Polished Chrome with Gold finishes as I felt that it had a more "classic" look about it (if I remember correctly, I also saw ballpoint and roller-gel versions too). The Muji Pen cost S$23.00 and comes in one colour only; matte silver. There is however a compact version of the same pen available (that becomes a full-length pen when posted). Though, as the brand naturally suggests, the Muji Pen is sold at Muji stores, however when I went looking for the pen, I was sorely disappointed to find that the pen was sold-out at their Ion Orchard, Somerset, Bugis Junction and Marina Square branches (Yes, I went to all those stores!). I finally managed to find a good stockpile of them at JEM and was very relieved to finally find it. Learn from my mistake; call ahead to reserve one or find out if its even available before heading down to the store. Muji has also just launched its online store here in Singapore, with a promotional 10% discount off all purchases, however I was unable to find the fountain pen on their website. The closest I managed to find was the same compact pen design, but with a ballpoint pen version instead (see link below). As mentioned previously, both feature an "Iridium Point" nib (but in varying colours, i.e. gold and silver respectively). The Muji Pen's nib states that it is an "F", whereas the FC Pen did not state what size it came in, and even after inspecting the packaging of the FC Pen more thoroughly, I was however still clueless about the size of the nib (this was a frustrating experience for me). It was only later, after googling more about the FC Pen that I realised it was an "M" nib. Purely on visual observation alone, both feeds appear to be different, and as the picture above shows, the Muji feed tends to be a bit "beefier", with deeper grooves and thicker fins, whereas the FC Pen's grooves/fins are shallower, thinner and more numerous. When I bought both the pens, and had plugged in the respective cartridges that came with each pen, I found that there were ALOT of starting issues with both. They tended to skip alot, and when writing fast, both pens dried out and refused to start-up again even after giving them a vigorous shaking. I was disappointed and crestfallen. However, after doing a bit of research and asking around, I was advised to pull out both nibs/feeds (both are friction-fit and come off easily) and to give them both a good wash under running tap water. This was because, (as I had been told by a senior collector) new feeds are sometimes coated with grease to prevent the ebonite/plastic feeds from drying out (and becoming brittle) while in the store, and will therefore require a good washing before use. After having done so, I was amazed at how smooth and fluid both pens began to write. Lesson learnt: wash both nibs and feeds thoroughly before using. The Muji Pen can feel quite light and hollow at times, however the FC Pen has a good weight and balance to it when writing. I also found the Muji Pen to be too thin and the knurled grip to be quite uncomfortable to hold. Also, due to its thin size, I found myself gripping the pen a tad bit too hard and as a result my hand would cramp if writing fast and over an extended period of time (as I had experienced while at work). To rectify the "thinness" of the barrel, I slipped on some Pilot G2 rubber grips that I had laying around at home (see picture below - lubricate the barrel first and the rubber grips slip on easily!). Though, the end product might not be as aesthetically appealing as the original clean-matte-silver look it came in, I now find writing with the Muji Pen to be comfortable and pleasing (the rubber also gives the Muji Pen some much needed weight and balance, and makes for a better writing experience). After having washed both the nibs/feeds, they now write very well. I did not observe any skipping or stoppage in the ink flow when writing (as I had experienced before). Both felt "stiff" and did not allow for very much "flex" when writing (i.e. practically no line variation at all). Surprisingly too, the "F" nib of the Muji Pen was much "wetter" than the "M" nib on the FC Pen. It may however be due to the type of paper or different inks I was using in each pen (i.e. Brilliant Black Pelikan 4001 in the Muji Pen and the standard Franklin Covey Ink per the cartridge provided). I also observed some bleeding of the ink of the Muji Pen on the paper (See the writing sample above). I generally prefer "wetter" pens, both however appeal to me, and I have no qualms with either pens' writing performance. Both use standard international cartridges. I had purchased a Pelikan converter (S$8.00 from Fook Hing) for the Muji Pen, and found that it fits perfectly on both pens without any problems. (Muji clearly offering the cheaper pen, though it was a pain to find!). Tie. Both are equal in that both claim to be "Iridium Point" Nibs. (Personally, to me, there are no observable differences when writing with either). The FC Pen has a sleeker, more professional look, which I would proudly carry with me into any work function or meeting. The Muji Pen however looks rather surgical and drab, which may also be ideal for anybody who wants to remain low-key and unnoticeable. (FC Pen wins with its classy and timeless look). As mentioned earlier, the Muji Pen felt too thin (and hollow) for my hands and caused my hand to cramp when using it for fast writing over an extended period of time. I did not have that problem with the FC Pen which has a fatter barrel and a heftier feel to it too. (FC Pen wins again; it generally feels more solid and pleasing to hold). Tie. Both use standard international converters/cartridges. Tie. Both are equal in terms of smoothness and both feeds can keep up with my furious writing speeds. I enjoy writing with them as both offer a good "stiff" feel when writing. Overall, both are great pens, I use both of them interchangeably and frequently while at work (whether in the office or out at a meeting) - and I would recommend either of them to friends, albeit with a certain amount of caution and advice (i.e. washing the nib/feeds, pricing of the pens and thinness of the Muji Pen's barrel, especially for people with bigger hands). But for the sake of having an explicit victor, in my humble opinion, I think that the FC Pen is marginally better, but it is still very debatable as to whether it is worth the extra S$10.00 (if you are price conscious and have small hands - then the Muji Pen is the way to go!). 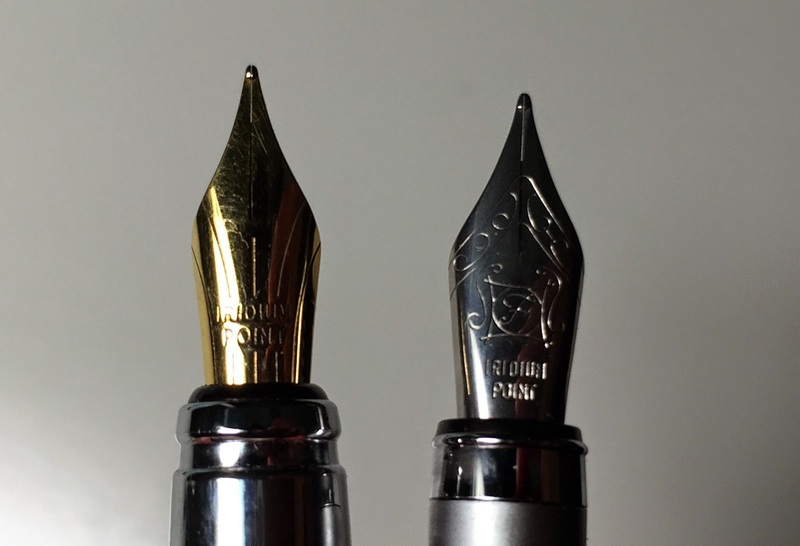 What is the Purpose of a Hooded Nib?